DuroSite incorporates Cree's Xlamp® XP-G LEDs and delivers about 12,000 lumens while using 150 watts. 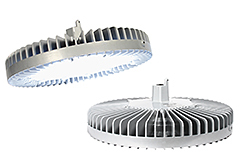 The XLamp XP-G LEDs provide a wide viewing angle, symmetrical package, and electrically neutral thermal path, which create high light output and maximum efficacy. The luminaires feature instant on-off operation, requiring no warm-up time for full illumination. Facilities can easily recycle the fixtures because they do not contain hazardous materials, including mercury. The fixture offers a range of mounting options and retrofit into existing wiring systems.